In the Methacton School District in a Philadelphia suburb, a high school oceanography class recently visited the Great Barrier Reef, while a Spanish class traveled to cities in Spain and Mexico. The students and their teachers were taking part in the Google Expeditions Pioneer Program to test out a virtual reality (VR) platform built for the classroom using Google Cardboard, which requires only a smartphone, an inexpensive cardboard phone holder and an accompanying app. 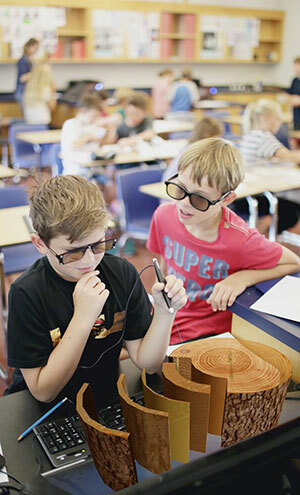 Chris Lloyd and Layla Lyons, teachers who work as technology integration specialists in the district, said the expeditions were a nice complement to topics that certain classes were working on and the technology itself was fairly straightforward to deploy. "The teachers were excited once we introduced the concept to them at a faculty meeting," Lyons said. "When it came time to schedule it, everyone wanted to do it." Based on their early experience, Lloyd said the district would definitely pursue implementing Google Expeditions in the future. "From the second they finished their expeditions, the teachers were asking how we could get these." Looking back through the archives of THE Journal, you can find articles about the potential of VR dating all the way back to 1999. So why have previous VR technologies failed to catch on in public schools? And are the consumer technologies being introduced today, such as the HTC Vive and Oculus Rift, more likely to find a home in classrooms? "Back in the 1990s, there was cheap VR, but it was very low quality," said Jeff Jacobson executive director of Boston-based PublicVR, a nonprofit organization involved in research and software development related to virtual reality in education. "Now you can get the Google Cardboard, which is about the price point you need for most K-12 schools, although you still need a good smartphone." Jacobson said other recent developments in the VR space, including the head-mounted displays such as the Oculus Rift and its competitors are exciting, but so far they are all priced between $500 and $1,000. "Those are aimed at the high-end gamer audience. It might make sense for a school to have a few of those, but they are not really aimed at K-12." Venture capitalists and tech giants clearly see a future in VR. Facebook paid $2 billion for Oculus VR in 2014. This year a secretive Florida-based company called Magic Leap received $793 million in a Series c venture funding round to work on some type of wearable device that enable a virtual reality immersive experience. Whether future price drops make their offerings more viable for schools or whether these vendors develop a K-12 focus, the larger question is why is VR potentially valuable to schools? A virtual field trip is the easiest idea, but there is so much more, Jacobson said. "Anytime you want to have an inside view of something — an atom, a magnetic field, the human body, or a building — VR is really going to help you. For anything having to do with simulation of active things like physics problems or climate change patterns, if being in the middle of the simulation is helpful, then VR helps you." Jennifer Holland, program manager at Google Apps for Education, said the Expeditions concept grew out of a Google hackathon. "We were trying to find a way to enable teaches to bring to life concepts and lessons they were teaching in class. We have a new VR platform called Cardboard that had just launched and that required only a simple piece of cardboard, stereoscopic lenses and a mobile phone, and we have this 360-degree imagery from Google Streetview," she said. "So we created an app that allows the teacher to take students to places a school bus could never go, with panaromas and points of interest to make it easy for them to integrate it into existing curriculum and bring lessons to life." 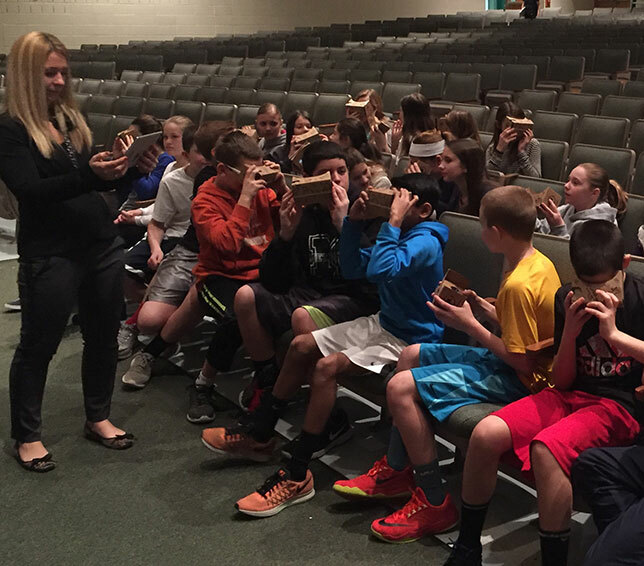 While higher-end VR systems can be expensive, some districts are making the investment. Liberty County Schools, a 10,000-student district in Hinesville, GA, has spent almost $500,000 on VR system labs for six schools using technology and curriculum from a Sunnyvale, CA-based company called zSpace. Its technology allows students to interact with simulated objects in virtual environments. The zSpace lab in a typical school includes a virtual reality station for every two students and a teacher station, each outfitted with tracking eyewear and an interactive stylus. Virtual-holographic images can be "lifted" from the screen and manipulated with the stylus. Students working with a virtual heart can see it pumping, hear it, and feel it beating. Liberty Superintendent Valya Lee said, "We already had 3D printers in our district, so when I heard 3D, my antenna went up. We thought this would be one aspect in broadening students' horizons beyond what they would be typically exposed to." She said the VR system comes with a plethora of lesson plans and learning support built in and is aligned with the district's initiative on personalized learning. Beyond the obvious excitement about something new and enhanced student engagement, Lee is convinced that the systems will have an impact on student performance. "Any time you try to measure direct impact, you have to allow for other variables. That is what we are trying to do — build a comprehensive framework for digital learning experiences including zSpace." She added that although the price tag may sound hefty, "once we get it into our other schools, we think it will more than pay for itself over time." If high-end virtual reality headsets seem too futuristic or unrealistically expensive, there are other options for bringing two-dimensional material to life. Adam Newman, an assistant principal in the New York City area, is also the CEO of Aug That!, an augmented reality app that allows a student or teacher to scan an image with a smart device. The picture will come to life either by becoming a 3D figure, 360-degree virtual environment, or an animated lesson. "I see the power of virtual reality, but the technology is not perfected yet. Students are getting nauseous," he said. "Augmented reality is more cost-effective for a school district. When I look at augmented reality, it is starting to become more mainstream." After experimenting with some commercial augmented reality solutions for a few years, he decided to launch his own K-12-focused app about two years ago. "As an educator, the biggest concerns I had were student engagement and technology infused in the classroom that teachers feel comfortable with because teachers can be hesitant with new technology," Newman said. "If it gets too complicated, teachers will not use it, nor will they push it. I created my own app that made it user-friendly for teachers and students." He said the app has been particularly popular in grades K-8, but he is starting to see high school students create virtual labs they can take home with them. Most teachers face time constraints and are not going to spend time to take advantage of these emerging technologies, he added, but if you make it easy for them, they will use it. "When I was observing other types of augmented reality in the classroom, I saw that first student have an a-ha moment where they understood it and it made them want to look at more. That has been the driving force for me." Collin Brooks, a physical education teacher at Jewell Elementary School, a 1-to-1 iPad school in Bend, OR, uses Daqri's Anatomy 4D app and the company's design studio for augmented reality, which allows teachers to design their own lessons. All teachers have to do is print one of the target images and have students look at it through the app. They can see a 4D model of the human body and view various biological systems, turning them "on" and "off" with the touch of a button. "I like how it enriches the learning experience," he said. "It adds an extremely powerful visual to the different components of physical fitness we are working on." The augmented reality allows users to isolate bodily systems: muscular, skeletal, circulatory and more, to see every detail and how each one works together. "The 4D animated heart is an excellent visual for students and is engaging," he said. So will pioneering districts start conducting pilot projects with VR and publish research on the impact on student outcomes? "In a rationale world that would happen," Public VR's Jacobson said. "That is the right way to do it. The more solid research the better, but where is the funding going to come from?" He said funding for that type of research through the National Science Foundation and Department of Education has been cut. "The other path is just social sharing among teachers," he said. "Now that VR is cheaply available, you have teachers just playing with it. All you need is one teacher in a school who says, 'This is great. I got my kids to stop fighting and freak out over this piece of technology for an entire session and my test scores went up.' All the other teachers will start doing it." When Rex Kozak was the principal of East Marshall's LeGrand High School in LeGrand, IA, the school received a donation of 3D modeling hardware and software. Kozak said the key is to allow the students to follow their own interests and make the assignments open-ended rather than canned. "It just comes down to the students' interest in how they want to apply it," he said. "I see students create eyeball sockets in biology class or create historic Spanish ships and use Spanish language to explore it. Others recreate battlefields. We see them get into passions like gaming or designing or creating a movie or video. They start getting into the programming. If you told them you were going to teach them that, it would turn a lot of them off, but because they are doing it this way, they get into it." Students are able to share their work with other students and businesses and enter their work into scholarship contests. "Whether the students are struggling or getting straight 'A's," Kozak said, "when they get into the virtual world, their energy and understanding of how to do things comes alive."